The author is Senior Officer, FAO Feed Resource Group. The article has been prepared with the collaboration of the staff of the FAO Animal Production and Health Division. "Development will bring food security only if it is people-centred, if it is environmentally sound, if it is participatory, and if it builds local and national capacity for self-reliance. These are the basic characteristics of sustainable human development." Although food availability has increased along with the growing human population over the last 30 years, there are still 800 million people suffering from malnutrition. This problem is not only the result of insufficient food production and inadequate distribution, but also of the financial inability of the poor to purchase food of reasonable quality in adequate quantities to satisfy their needs (FAO, 1993a). Livestock production constitutes a very important component of the agricultural economy of developing countries, a contribution that goes beyond direct food production to include multipurpose uses, such as skins, fibre, fertilizer and fuel, as well as capital accumulation. Furthermore, livestock are closely linked to the social and cultural lives of several million resource-poor farmers for whom animal ownership ensures varying degrees of sustainable farming and economic stability. The importance of livestock in the agricultural sector has been emphasized in a number of FAO publications, notably, Livestock production: a world perspective (FAO, 1982), The role of ruminant livestock in food security in developing countries (FAO, 1992), Livestock and improvement of pasture, feed and forage (FAO, 1993a) and Strategies for sustainable animal agriculture in developing countries (FAO, 1993b). This article does not attempt to be comprehensive, but rather aims at emphasizing the importance of both direct and indirect contributions of livestock to food security and sustainable development at a global level. Human and livestock populations have both grown considerably over the last three decades, although at different rates (Table 1). The major differences are found between developed and developing countries. Since 1960 the total human population has increased by 75 percent, but developing-country populations have grown by 97 percent, compared with 28 percent in the industrialized world. All categories of livestock have increased in number as well, with a much greater increase for monogastric animals (pigs and poultry) than for ruminants. Ruminant populations have grown at about half the rate of the human population, while small ruminant populations (sheep and goats) have only increased in developing countries. The pig and poultry populations, however, have grown about one-and-a-half to two times that of the human population, and are three to four times greater in developing countries than they are in developed countries. The world population is expected to increase from 5.4 billion to at least 7.2 billion within the next two decades, mainly in developing countries. 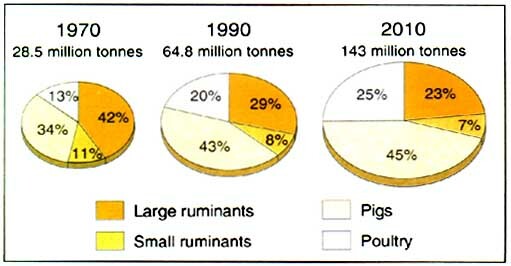 This increase in human population, with the resulting increase in pressure on land and changes in composition of the livestock population, will have a major effect on both available natural resources and future demand for commodities, and this will consequently determine the type of livestock feeding and production systems to be adopted. Official statistics tend to underestimate the overall contribution of animals since they generally underestimate or ignore the multipurpose role livestock play in food and agricultural production, as well as in the social life of small-scale farmers in developing countries. To feed the growing human population, more land will need to be devoted to the cultivation of food and cash crops and, being a finite resource, this will reduce its availability for pasture and fodder, as has already occurred in Asia (Table 2). On the other hand, increased food and cash crops will make available more crop residues and agro-industrial by-products, many of which represent valuable animal feed resources for which there is known technology to support increased levels of production. It is clear that, in order to maintain food production, the efficiency of resource utilization must be increased and alternatives - such as marine and freshwater fish culture - must be developed. · Competition with alternative land uses and with the use of cereals (and some roots and tubers) as animal feed or for human consumption. · Competition for carbohydrate and protein sources. · Inability to meet national targets for animal proteins. · Only a few large investments in livestock development projects have been marginally successful in increasing productivity and these have had a limited impact on agriculture. · Inadequate demonstration of how livestock can play a key role in the development of sustainable agriculture in different agro-ecosystems, and the failure to transfer appropriate technologies. In particular, most of the increase in animal products has come from an increase in animal numbers rather than from an increase in individual-animal productivity. · Resource degradation and environmental damage caused by deforestation, overgrazing and pollution. · Contribution to global warming (methane from ruminants represents 2.5 percent of total greenhouse gases). · Pollution from concentrations of intensive animal production enterprises. Many of these problems are a result of the inability to identify appropriate technologies and define strategies for livestock development that are applicable to individual agro-ecosystems. Often, technology is transferred from developed countries unmodified, rather than generating appropriate technologies within the developing countries themselves. Imported technologies have almost always failed to overcome the constraints imposed on local farming systems or to meet the socio-economic requirements of the local farmers. · improved capacity and commitment of national and international agricultural centres and non-governmental organizations (NGOs) to implement strategies that contribute to the development of livestock production within specific agro-ecosystems/ecoregions. In livestock production, the overriding considerations are the availability and efficient use of local natural resources. A successful livestock development strategy requires the formulation of resource management plans that complement the wider economic, ecological and sociological objectives. Particular attention needs to be given to land-use systems and to the natural resources required for improved livestock production. The strategy will also need to consider the social, cultural, political and institutional elements that affect the management of natural resources. On the policy side, issues relating to land use, common property, legislation, price policies, subsidies, levies, national priorities for livestock development and research capacity have to be addressed. Finally, the implementation of action programmes requires both technical and institutional support and, equally important, government commitment. Trends in livestock food supply in developing countries. Livestock are important contributors to total food production. Moreover, their contribution increases at a higher rate than that of cereals (Table 3). Recent increases in livestock products appear to be even more spectacular than those achieved for cereals from the green revolution. Most notably, egg production has increased by 331 percent over the last two decades, compared with 127 percent for meat production, 78 percent for cereals and 113 percent for fish (equivalent to 58 percent of that of meat production). By the year 2010, animal products are expected to contribute proportionally much more to the food supply than they do at present, since income determines the protein intake of people, particularly in urban areas. Of the different animal species, meat production from monogastric animals (poultry and pigs) has increased at a much higher rate than that from either small ruminants (sheep and goats) or large ruminants (cattle and buffaloes). While in 1970 ruminant and monogastric meat production rates were approximately equal, it is expected that by 2010 monogastrics may produce 2.4 times more meat than ruminants, providing that feed is available and affordable (Figure 1; Box 1). Given the low per caput intake of animal products in developing countries compared with that in developed countries (Table 4), there is considerable potential for increasing consumption and, hence, production of animal products (milk and meat) in these countries. An enormous number of poor people in developing countries cannot afford to include animal products in their diets - they are vegetarians by necessity rather than by choice. Calories. Animal products are primarily a source of proteins and essential amino acids, but when they are a major constituent of the human diet they also contribute a significant proportion of total calories. In developed countries they provide more than 30 percent of calories in the diet (Figure 2). In developing countries, however, this proportion is less than 10 percent, but they are a source of essential amino acids that balance the largely vegetable-based proteins. Proteins. 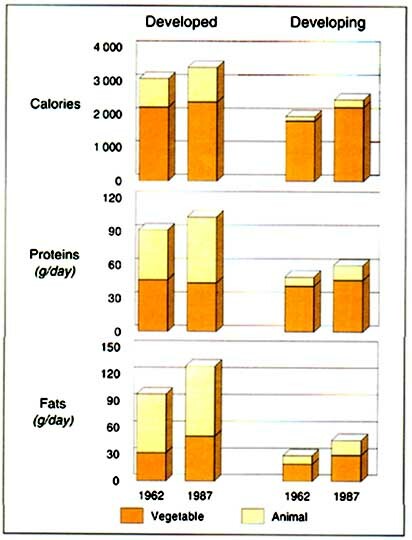 In developed countries, about 60 percent of the dietary protein supply is derived from animal products, which is higher than necessary for essential amino acids (Figure 2). This figure is only 22 percent in developing countries, which is less than desirable and takes no account of the skewed distribution in favour of the middle classes - the poor actually have a much lower protein intake. In these countries, where diets are composed of only a small number of staple foods, animal products are of great importance in preventing malnutrition as they are concentrated sources of the limited essential amino acids available in vegetable proteins of staple foods. Fats. Excessive consumption of calories, particularly fat from animal products, is often the cause of human health problems, especially in wealthy societies. Figure 2 clearly demonstrates that excessive consumption of animal fat is not a problem for people in developing countries. In fact, animal fats complement an often-deficient calorie intake. Livestock help to alleviate seasonal food variability. Even though milk production is seasonal and surpluses cannot be stored as easily as cereal grains, there are simple technologies that allow herders to keep milk products for weeks or months in the form of clarified butter, curds or various types of cheese. Animals, particularly small livestock, are slaughtered as the need arises. Meat preserved by drying, salting, curing and smoking can be used when other food sources are scarce. Animal products not only represent a source of high-quality food, but, equally important, they are a source of income for many small farmers in developing countries, for purchasing food as well as agricultural inputs, such as seed, fertilizers and pesticides. At the national level, livestock food products represent 27 percent of the total agricultural output. This subsector has achieved the greatest growth in production over the last three decades, and it is expected that it will continue to grow faster than all other agricultural subsectors in the next 20 years (Table 5). The total value of milk and meat represents 3.5 times the value of wheat and rice and 2.8 times the value of fish (Table 6). In addition, there are various other products and services provided by livestock that are not accounted for in these statistics, but which would increase the total value of livestock considerably. At farm level, cash can be generated regularly from direct sales of livestock products, such as milk, eggs and manure, occasionally from the sale of live animals, wool, meat and hides and from fees for draught power or transport services. An important feature of dairy income is its regularity. India's dairy development programme Operation Flood has created cooperatives that pay daily for the milk delivered, thereby providing regular income to thousands of poor farmers. An FAO/United Nations Development Programme (UNDP) dairy project in Burkina Faso assisted 100 families in increasing their monthly income by about US$80, which is equivalent to an extra labour unit per family. In many countries, the provision of animal draught power services for cultivation, transportation and the pumping of irrigation water is an important source of income that is particularly beneficial to landless owners of cattle or buffalo. Livestock also provide increased economic stability to the farm or household, acting as a cash buffer (small livestock) and as capital reserve (large animals), as well as a deterrent against inflation. In mixed-farming systems, livestock reduce the risks associated with crop production. They also represent liquid assets that can be realized at any time, adding further stability to the production system. The importance of livestock as a source of income for poor farmers is illustrated by the example of the Grameen Bank in Bangladesh, which assists only the poorest segment of the population and provides about 50 percent of its loans for the purchase of livestock, mainly large ruminants for milk production and draught power. At farm level, dairying is a labour-intensive activity, involving women in both production and marketing. Labour typically accounts for over 40 percent of total costs in smallholder systems. It has been estimated that for each 6 to 10 kg of additional milk processed per day in India, one working day is added for feeding and care. Data from Kenya show that smallholder production there is in the order of 25 kg per working day; similar levels were experienced on parastatal dairy farms in Zimbabwe. Goat, sheep, poultry and rabbit husbandry, especially in backyard production systems, provides an important source of part-time job opportunities, particularly for landless women and children. The livestock-product processing sector has also been identified as a contributor to employment generation and the reduction of rural depopulation. Small-scale milk processing/marketing is labour-intensive (50 to 100 kg per working day) and generates employment and income from the local manufacture of at least part of the equipment required. The meat sector also provides significant employment opportunities. Based on UN published data and experience from FAO projects, estimates have been made of labour requirements in small to medium-sized slaughter and meat processing operations (Table 7). Do livestock of the rich eat the grain of the poor? Almost 50 percent of the grains produced in the world are fed to livestock, yet there remain about 800 million people suffering from hunger and malnutrition mostly in the developing countries. Because surplus grains are produced in developed countries, it has been assumed that increasing livestock production will be based on grains at the expense of poor people. Is this true? · About 85 percent of total grains fed to livestock throughout the world are fed to livestock in industrialized countries, but at an enormous environmental cost in terms of fossil fuel. Grain importation into developing countries has steadily increased, however, particularly to feed animals that are consumed by the minority higher-income sectors of society. The problem is twofold: first, the poor cannot afford to purchase these cereals because of their low income, and, second, the importation of grains distorts the market for locally produced feed resources. · Because grains are widely available in developed, temperate countries, or because they have the wealth to import them, these countries can afford to use the grains to feed animals, especially as production costs do not include the imputed costs of soil erosion, loss of fertility and environmental degradation. Developing countries, which have neither the available grain resources nor the money to import them, should, however, follow the same philosophy for feeding their animals, that is, they should use their own locally available feed resources, not grains! · Grains are not indispensable for feeding livestock. Historically, grains have been regarded as the most convenient, if not the only, way to feed monogastrics and even fatten ruminants. Subsidies to produce grains have assisted their use at the expense of feeding systems based on local resources. FAO has given high priority over the last 20 years to developing alternative feeding systems, for monogastrics as well as for ruminant animals, which make little or no use of grains. In five years, a project in China has made cropping zones become the most important producers of beef, using only urea-treated straw and cottonseed cake as supplements, with no use whatsoever of grains. Sugarcane juice, palm oil, sugar palm juice and cassava tubers have successfully been tested to replace grains in pig feeding in about 15 countries in the tropical Americas and Asia. Other local energy sources are being actively sought as alternatives to grains. In mixed-farming systems, not only can farmers mitigate risks by producing a multitude of commodities, but they can also increase the productivity of both crops and animals in a more profitable and sustainable way. In this context, livestock can make a major contribution to the efficient use of available natural resources. Draught animal power. Bovines, equines, camelids and elephants are all used as sources of draught power for a variety of purposes, such as pulling agricultural implements, pumping irrigation water and skidding in forests. The current number of animals used for draught purposes is estimated at 400 million. Fifty-two percent of the cultivated area in developing countries (excluding China) is farmed using only draught animals and 26 percent using only hand tools (Gifford 1992). During the past ten years, there has been a 23-percent increase in the number of cattle and buffaloes used for draught purposes as well as for meat and milk production. During the same period, the number of equines (horses, mules and asses) used primarily for draught and transport has not changed significantly. Compared with the use of tractors, animal power is a renewable energy source in many developing countries and is produced on the farm, with almost all the implements required made locally. On the other hand, 90 percent of the world's tractors and their implements are produced in industrialized countries and most of those used in developing countries (approximately 19 percent) have to be imported. Animal traction, therefore, avoids the drain of foreign exchange involved in the importation of tractors, spare parts and fuel. Draught animals remain the most cost-effective power source for small and medium-scale farmers. Draught animal power can be even more economic when one bullock is used instead of a pair or when a (cross-bred) cow is used instead of a male, since it reduces the cost of maintaining the larger herd necessary to satisfy both replacement and milk production requirements. 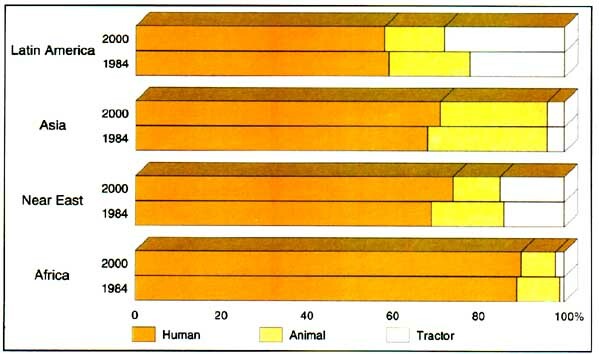 It is expected that draught animal power will decline slightly by the year 2000 (FAO, 1987) as will dependency on human power (Figure 3), but the contribution of draught animals will remain much more important than that of mechanical traction. Given their importance as major contributors to food crop production, as a risk-avoidance mechanism and as a source of income, greater efforts need to be devoted to promoting the wider and more efficient use of draught animals. Source: FAO, 1993c, p. 65. Dung for fuel. In many countries, cow dung is highly valued as fuel for cooking and heating, reducing expenditures for fuelwood or fossil fuels. It represents the major fuel supply for household use by millions of farmers in Asia, Africa and in parts of the Near East and Latin America. 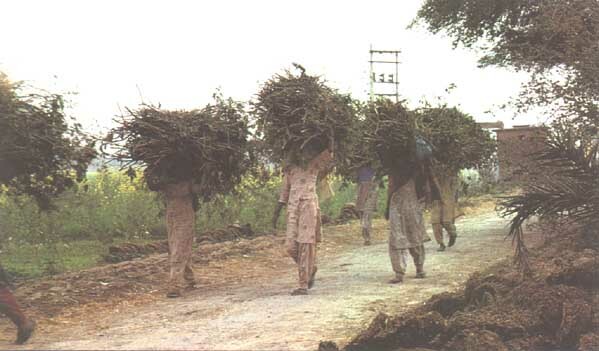 In India alone, 300 million tonnes of dung are used for fuel every year. The collection and drying of dung for cooking generates income for women. 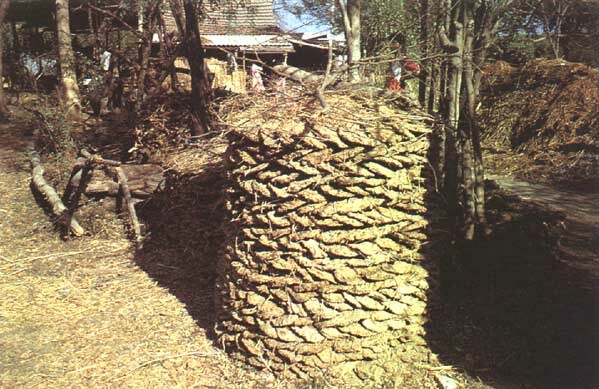 It is also used directly as plaster and other building materials, while its ash can be used as fertilizer. Biogas production. Biogas production from manure is an excellent substitute for fossil fuel or fuelwood for farmers in tropical countries. The best manure for these purposes comes from (in descending order) pigs, cattle, horses, camels and poultry (Kumar and Biswas, 1982). Twenty-five kilograms of fresh cow dung produces about 1 m3 of biogas. Simple low-cost plastic biodigesters have recently been developed in Cambodia, the United Republic of Tanzania and Viet Nam through a number of FAO/Technical Cooperation Programme (TCP) projects. On-farm biogas production reduces the workload of women by eliminating wood collection or fuel purchasing. It is person-friendly because of its convenience and increased hygiene, and it also provides a number of services, such as lighting, warm water and heating. Biogas can also be used to drive machinery such as water pumps. Effluent from biodigesters can be recycled as fertilizer - with even better results than the original manure (Talukder, Ali and Latif, 1988) - or as a fish feed, or it may be used to grow azolla and duckweed. Biogas technology has been successfully adopted by millions of farmers in developing countries; about 25 million people use it in China alone (Marchaim, 1992). New simple technology should be promoted to extend biogas development. Biodigestion has positive public-health aspects, particularly where toilets are coupled with the biodigester, and the anaerobic conditions kill pathogenic organisms as well as digest toxins, for example, botulinum toxin. In China, biogas (CO2+CH4) from dung has also been used to control insects in stored grains using the anaerobic reaction, without adverse effects on grain germination (Zhin and Pan, 1983). Nutrient recycling is an essential component of any sustainable farming system. The integration of livestock and crops allows for efficient nutrient recycling. Animals use the crop residues, such as cereal straws, as well as maize and sorghum stovers and groundnut haulms as feed. The manure produced can be recycled directly as fertilizer. 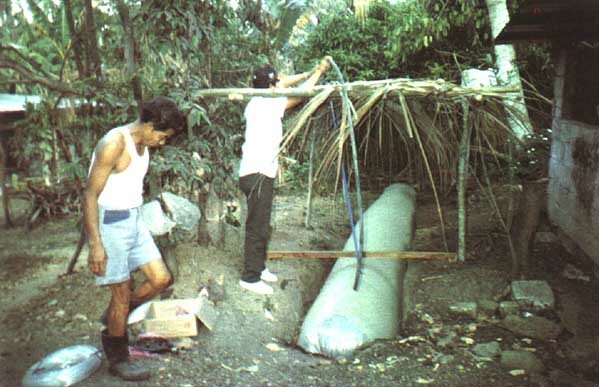 One tonne of cow dung contains about 8 kg N. 4 kg P2O5 and 16 kg K2O (Angé, 1994). The chemical composition of manure varies, however, according to the animal species (poultry manure appears to be a more efficient fertilizer than cow manure) and also to the nature of their diet. For example, farmers in Cambodia and the Niger have observed that they obtain more rice grain when they use manure from animals fed on urea-treated straw (because of its higher nitrogen content) than when they use that derived from animals fed on untreated straw. It has been estimated that, in the semiarid tropics, less than 6 percent of the cropped area receives an average application of 10 tonnes of manure per hectare every year. In the humid tropics, up to 12 percent of the cropped area may be manured at this level. In addition to the direct contribution of plant nutrients, manure provides important organic matter to the soil, maintaining its structure, water retention and drainage capacity. The value of manure is so well-recognized that some farmers keep livestock primarily for this purpose. The cultivation of legume fodders and trees, for example, in alley farming systems, also contributes to the enrichment of soils through nitrogen fixation. Soybeans in the humid tropics can supply 40 kg of nitrogen per hectare, although this contribution varies considerably with the species. 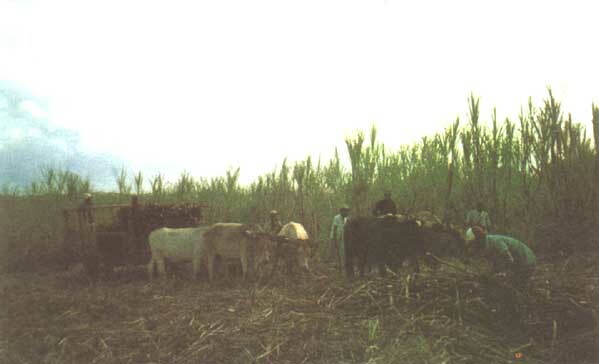 In systems using sugar cane as livestock feed, for example, in Colombia and Viet Nam, it has been demonstrated that the recycling of dead leaves into the soil (instead of burning them) favours the fixation of nitrogen by bacteria and reduces weed growth and water evaporation, thus increasing the yield of the subsequent harvest. Livestock, particularly sheep, are efficient in controlling weeds. They are used in many countries in the Mediterranean basin to reduce forest undergrowth so that the risk of fire during summer is diminished. In rubber and oil-palm plantations in Malaysia, the integration of livestock to utilize the vegetative ground cover under the tree canopy has been shown to increase overall production and save up to 40 percent of the cost of weed control (Chen et al., 1988). Similarly, sheep have recently been used to control weeds in sugar-cane fields in Colombia (Carte Asolucerna, 1994), suppressing the cost of herbicides, reducing by half the total cost of weed control and providing an additional income from meat production. Such systems also safeguard the environment and avoid chemical pollution while supplying additional organic material to the soil. Not only can manure be recycled for biogas and fertilizer, but it can also be a valuable source of feed for other animal species. For example, poultry manure is commonly used for ruminant feeding and poultry and pig manures can be used to generate algae as a feed for fish. By-products such as slaughterhouse wastes, when adequately processed, make a good source of protein (offal and viscera) and mineral (bones) supplements in animal feeds. In developing countries, household wastes are commonly fed to pigs and small animals in backyard farming systems. In urban and pert-urban areas, restaurant and catering wastes can be readily processed for pigs, as is done in Cuba. Industrial fish waste creates pollution around canning plants. The common practice is to dry it, at a very high cost, in order to produce fish-meal, which is then usually exported to developed countries. Preservation of fish waste in molasses has proved to be an option that is technically and economically feasible for poor farmers. Such recycling makes animal agriculture systems more sustainable and environmentally sound (Box 2). In the vast semi-arid or arid areas where crop production is extremely risky, livestock can use vegetation that would otherwise be wasted and convert it to valuable, high-quality products. However, these are environmentally fragile areas. Over the centuries, pastoralists established complex management systems that were sustainable until the relatively recent dramatic increases in population and subsequent livestock density. Overgrazing is the main threat to these areas, and a holistic approach to resource management is necessary to avoid their permanent and irreversible degradation. Crop residues, such as straw, are more efficiently utilized through ruminant feeding, including the production and use of manure and possibly biogas, rather than by burning them, creating pollution and contributing to global warming, or ploughing them back into the soil to improve its structure and water retention. Several hundred million head of cattle and buffaloes are fed throughout the year on rice and cereal straws. At present, developing countries are major importers of animal feeds (mainly coarse grains) as well as meat and dairy products. 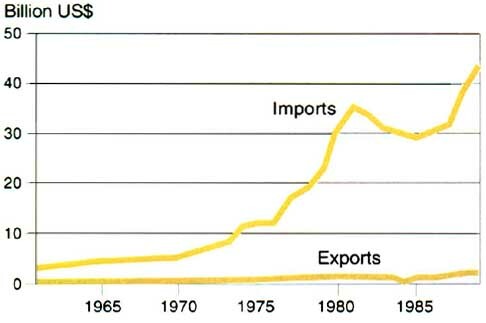 The cost of importing animal feeds into developing countries is estimated at between US$10 billion and $15 billion per year (Figure 4). Although exports of animal feeds are not negligible, a large proportion of them are oilseed cakes. Being an important source of bypass protein, the cakes could be put to better use locally to improve production from the national herd, which, in turn, would reduce imports of animal products. 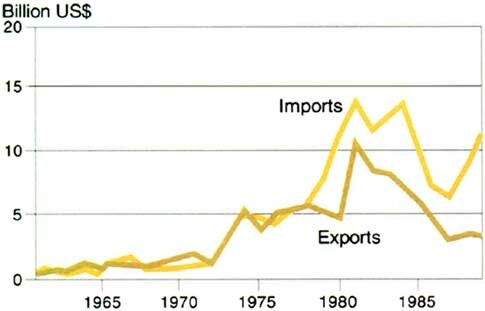 The trade of meat products is better balanced, as imports and exports have followed similar annual trends, as illustrated by the parallel curves plotted in Figure 5. Globally, however, these data mask the fact that exports are made by relatively few, high-producing countries only. There is still substantial potential for increasing local production to save foreign exchange from import substitution and to increase rural incomes. The situation regarding the importation of dairy products into developing countries is critical. 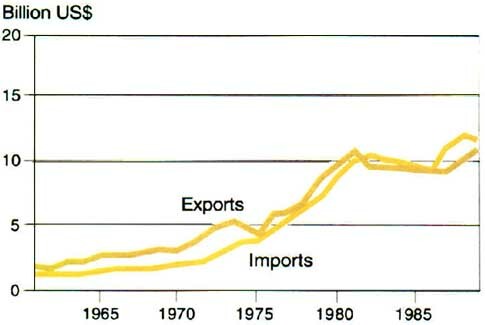 Imports have dramatically increased during the last three decades, while exports have remained negligible (Figure 6). The prospects for local dairy production have recently become more favourable, however, following the reduction of milk production subsidies in western developed countries and the introduction of more realistic exchange rates under structural adjustment programmes. These recent changes have provided many developing countries with the opportunity to develop their own milk industries, primarily through small-scale production, which will have a major impact on different levels of cash income. Do livestock contribute to environmental degradation? Livestock are often accused of contributing to soil erosion in different ways. One classic example is the deforestation in the Amazon to produce grazing land, which has attracted much attention from ecologists and the mass media. Yet clearly it is not the animals that cut down the trees! The responsibility lies with the business people who - aided and abetted by government subsidies - cause irreversible damage by destroying the forests to plant pastures for short-term financial gain. Another example is that of the long-term overgrazing of semi-arid rangelands, which has lead increasingly to desertification. It is well known, however, that sound resource management could avoid this deterioration of the environment while maintaining a productive system. If livestock are managed in an appropriate way, they can even contribute to the reduction of soil erosion. The use of perennial fodder trees and high biomass fodders (sugar cane) and the establishment of fodder hedgerows on the contour provide excellent protection against erosion and should be established practices. Agro-sylvo-pastoral systems in semi-arid areas are a viable proposition for the protection of the fragile soils of these regions. Multipurpose trees contribute to the protection of the soil, as well as to animal and energy production, and store carbon that would otherwise contribute to atmospheric carbon dioxide. It is also a criticism of ruminant production that the animals contribute to the greenhouse effect, since they produce methane as an end-product of rumen digestion. It should be recognized, however, that ruminant populations have increased only moderately compared with those of other species, and that their contribution is estimated at just 2.5 percent of the total greenhouse gases (Leng, 1993). Gas emissions from cars and industry are far greater and have increased at a much higher rate. There are two ways to reduce methane emission from livestock: by introducing an appropriate diet supplementation that could reduce ruminant methane production per unit of milk or meat by a factor of 4 to 6, and by favouring the production of meat from monogastric animals. The third complaint about livestock is pollution resulting from accumulated excrete and nitrite-contaminated groundwater. This is primarily a problem with intensive, industrialized production systems. It can be reduced by implementing manure processing technologies as well as nutrition and feeding strategies that reduce the amount of nitrogen and phosphorus in the diet of animals. It could also be controlled by limiting the size of such enterprises to that which allows excrete to be easily accommodated on neighbouring lands or used for fertilizer products. Smallholders usually cause less pollution than large intensive units. In the rural areas of many developing countries financial services such as credit, banking and insurance are virtually non-existent. In these areas, livestock play an important role as a means of saving and capital investment, and they often provide a substantially higher return than alternative investments. A combination of small and large livestock that can be sold to meet petty-cash requirements to cover seasonal consumption deficits or to finance larger expenditures represents a valuable asset for the farmer. Hides and skins. The yield of hides and skins in relation to the overall weight of the slaughtered animal is approximately 6.5 percent for cattle and 10 percent for small ruminants. Pig skins are not considered a by-product since they are usually used as food. World production of hides and skins increased significantly between the 1960s and the 1980s, with bovine hides reaching 1.8 million tonnes (55-percent increase) and sheep and goat skins up to 220 000 tonnes (5-percent increase). Over the same period, however, production in developing countries fell; bovine hides dropped by 50 percent (down to 47 000 tonnes) and sheep and goat skins were reduced by 25 percent (down to 68 000 tonnes). Since the number of cattle and small ruminants slaughtered has not declined in developing countries, it must be concluded that hides and skins are not being fully utilized. FAO has already initiated efforts to improve flaying techniques to increase hide and skin quality. The world market price for cattle has varied between US$1.50 and $2 per kilogram over the last ten years, which ought to give adequate incentive for the production of better quality raw hides and skins. Other functions. Often livestock keeping has considerable social and cultural- significance, which may be the main reason for keeping animals in many societies. It is not always possible to attach monetary value to many of these roles. Nevertheless, they cannot be ignored, since animals for cultural or religious events may command very high prices. The contribution of animals to both agricultural and overall economic development has not been adequately evaluated. Official statistics grossly underestimate the contribution of livestock since many important non-food outputs - most of which are difficult to quantify in monetary terms - are excluded. Improved efficiency of animal agriculture, with its various commodities and service products, is crucial to achieving sustainable agricultural development and food security, particularly in low-income, food-deficit countries. The role of animals in food and agricultural development programmes is underrated almost everywhere throughout the world despite the increasing demand, especially in developing countries, for all the different animal products and services. A prerequisite for the sustainable development of animal agriculture is the identification, testing under local conditions and promotion of appropriate technologies that utilize local and affordable resources. Policies, infrastructure and support services enabling such technologies to succeed and reach small-scale farmers must be established. The integration of livestock and agriculture increases both the short-term benefits and longer-term sustainability. The livestock sector is both multifaceted and flexible enough to be able to react to changes in the national economy. Species of monogastrics and ruminants are available that are adapted to different local conditions and are able to utilize local resources to produce valuable products and services. Greater emphasis should be given to monogastric animals, as they are the main suppliers of meat and have been largely neglected in development programmes. Care must be taken to use alternative feeds that do not compete with human food. The importance of ruminants must not be forgotten, however, and particular attention is required to develop their role as a source of draught power. Greater attention should be given to the provision of facilities and credit that benefit the small-scale producer, rather than major investments in institutions and facilities, such as big slaughterhouses, dairy plants and feedmills, which are usually oversized, overstaffed and overequipped. Do all livestock projects fail? Livestock projects have a bad reputation among development banks and institutions, which have become reluctant to fund new projects. It has been stated that: livestock eat cereals that would be better used for feeding people; livestock cause environmental deterioration; livestock products are not indispensable in the diet; livestock projects are not viable in economic terms. However, provided that the right technologies are identified and applied, taking into account the local constraints, and that the appropriate support in expertise, the logistics for the supply of inputs and the marketing of animal products are ensured, livestock projects have proved to be very profitable, in both economic and social terms, on many occasions. The following are some spectacular examples of successful projects. · Operation Flood in India, which promotes dairy development among small or landless farmers, has established a modern and efficient dairy industry in that country. Similarly, in Uganda, a dairy project has successfully developed milk production around Kampala under difficult conditions, while small cheese-making units in the Niger have provided several hundred women with jobs and income. 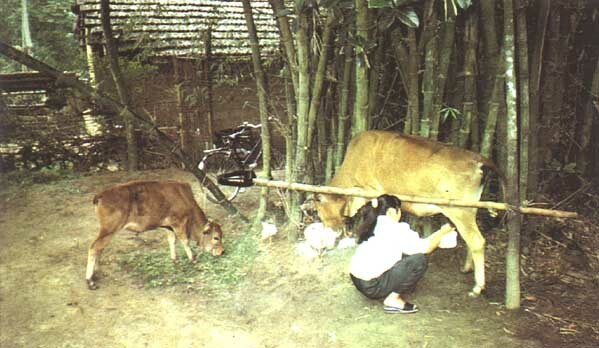 · The beef-fattening project in the Hebei and Henan provinces of China. By using local resources, such as cereal straw treated with urea, adequately supplemented with cottonseed cake, the farmers of these provinces have become the most important beef producers of China. Strategies for on-farm testing and field support activities were similar (but applied on a much larger scale!) to those implemented in another successful beef-fattening project in northern Tunisia in the 1970s. · The New World Screw worm (NWS) project in North Africa which, using environmentally safe biotechnology, successfully eradicated this threatening pest from the region in less than four years, has been a remarkable example of efficient organization and cooperation between donors and United Nations executing agencies. It is now more widely recognized that livestock projects are as successful as any other agricultural projects, if not more so. Angé, A.L. 1994. Integrated plant nutrition management in cropping and farming systems: a challenge for small farmers in developing countries. Rome, FAO. 7 pp. Carta Asolucerna. 1994. In Livestock Res. Rural Dev., 6(1). Chen, C.P., Ahmad Tajuddin, Z., Wam Mohamed, W.E., Tajuddin, I., Ibrahim, C.E. & Moh Salleh, R.1988. Research and development on integrated system in livestock, forage and tree crop production in Malaysia. In Proc. of the FAO/MARDI International Livestock-Tree Cropping Workshop, 5 to 9 December 1988, Serdang, Malaysia. p. 55-71. FAO. 1982. Livestock production: a world perspective. In The State of Food and Agriculture 1982, p. 76-141. Rome, FAO. FAO. 1987. Agriculture: toward 2000. Rome, FAO. FAO. 1992. The role of ruminant livestock in food security in developing countries. FAO Committee on World Food Security, 17th Session, 23 to 27 March 1992, Rome, Italy. 33 pp. FAO. 1993a. Livestock and improvement of pasture, feed and forage. FAO Committee on Agriculture, 12th Session, Item 7, 26 April to 4 May 1993, Rome, Italy. 19 pp. FAO. 1993b. Strategies for sustainable animal agriculture in developing countries. Proceedings of the FAO Expert Consultation held in Rome, Italy, 10 to 14 December 1990. Edited by S. Mack. FAO Animal Production and Health Paper No. 107. Rome, FAO. 271 pp. FAO. 1993c. Agriculture: towards 2010. Doc. C 93/24, November 1993. 320 pp. Gifford, R.C. 1992. Agricultural engineering in development. Mechanization strategy formulation. Vol. I: Concepts and principles. FAO Agricultural Services Bulletin 99/1. Rome, FAO. 74 pp. Kumar, S. & Biswas, T.D. 1982. Biogas production from different animal excrete. Indian J. Agric. Sci., 52(8): 513-520. Leng, R.A. 1993. The impact of livestock development on environmental change. In S. Mack, ed. Strategies for sustainable animal agriculture in developing countries. Proceedings of the FAO Expert Consultation held in Rome, Italy, 10 to 14 December 1990. p. 59-75. FAO Animal Production and Health Paper No. 107. Rome, FAO. Marchaim, U. 1992. Biogas processes for sustainable development. FAO Agricultural Services Bulletin 95. Rome, FAO. 232 pp. Talukder, N.M., Ali, M.S. & Latif, A. 1988. Effect of biogas effluent on the yield and quality of rice. Int. Rice Comm. News., 37: 11-16. UNDP. 1994. Sustainable human, development and agriculture. UNDP Guidelines Series. New York, NY, USA, United Nations Development Programme. 92 pp. Zhin, L.Z. & Pan, X.F. 1983. A new measure on the control of grain storage insects by marsh gas. Kunchong Zhishi (Insect knowledge), 20(3): 118-119.